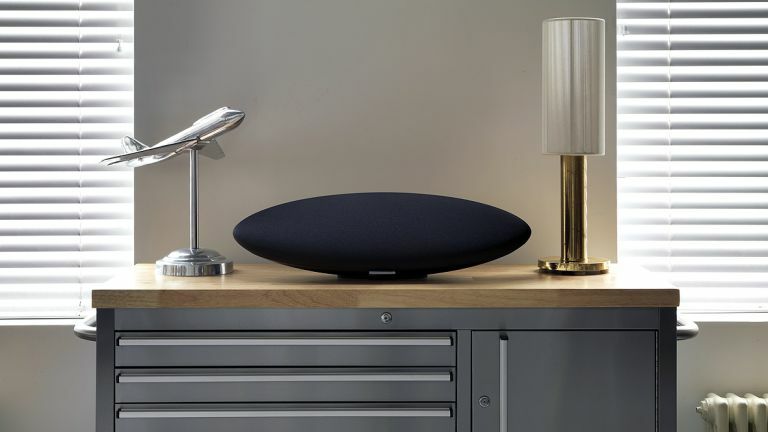 Bowers & Wilkins' original Zepellin pretty much invented the premium iDevice dock as a sector, dominated at its price point and, B&W admits, was probably better known than the company itself within a year or so of launch. Well, now it's back and from what I've seen and heard, it's better than ever. The headline change on this £499 new arrival is that the dock has vanished from the front (though a 3.5mm line in is still stashed round the back), and connectivity is now via AirPlay, Spotify Connect (both via Wi-Fi or ethernet) plus Apt-X Bluetooth. The result is a pared-down, moody look that makes a statement without leaping out and shouting "Hello, I'm an expensive bit of hi-fi equipment!" You get basic volume and skip controls, with everything else happening via your iTunes or Spotify controller of choice - desktop and mobile are supported - B&W's own app, or Apt-X Bluetooth audio. This is a great-looking speaker, and more attractive than current wireless audio poster boy, the Naim Mu-so. The inside of the Zepellin Wireless has been redesigned almost in its entirety ("The screws are still the same… But they're in different places"), with B&W drawing on its expertise in making high-end, traditional speakers that cost thousands. So the tweeter tech is the same found in its CM series, while the “Fixed Suspension Transducer” (FST) driver technology found on the flagship 800 Series Diamond is also employed. This allows B&W to deploy some absolutely world-class audio gibberish in its press release. Enjoy. 'FST's innovative surroundless suspension allows for the edge of the speaker cone to terminate without any resonance… An anti-resonance dust cap is fitted to the voice coil bobbin, and has been tuned to reduce the voice coil resonances. The result is a smoother midrange response.' Aha. In layman's terms, I'd say the 150W (4x25W mid-range drivers plus a 50W sub) Zeppelin Wireless is a clever mix of classic loudpeaker construction with cutting-edge digital processing and designer looks. All inputs are up-sampled through an 'audiophile quality' 192kHz/24bit DAC and the Zepellin's digital signal processing (DSP), which is decribed as, 'twice as powerful as Zeppelin Air,' then works to ensure that sound is as good as it can be, whether at high or low volume levels. So what does it sound like? Good. Really good. I've only had a brief exposure to the Zepellin so far, but it was genuinely impressive. I've sat through so many mid- to high-end audio demos where I've had to smile politely and say, "Mmm yes, very clear," while counting the minutes till the meeting's end, but this was not like that. It sounded like music rather than "hi-fi", and it rocked. Previous Zepellins have worked superbly with accoustic and gentle sounds, and the Wireless does too, but there seems to be real punch and bite added here. Electronic dance music really pumped, with plenty of bass, but it was low-end that was never less than controlled and musical. The stereo seperation was also impressive, a testament to how cleverly B&W has placed its drive units. I should point out that this demo was with Spotify Connect, which is nobody's idea of an audiophile source. That makes the sound quality mustered up even more impressive; a kind of lead-into-gold audio alchemy. You can quibble over the lack of DLNA or support for HD audio, but support for Spotify Connect, Bluetooth and AirPlay means practically all users are catered for. Given the success Naim has made of its aforementioned, £900 Mu-so, it seems to me that this should absolutely fly off the shelves at £500. We should have a review unit within the week. Hopefully, this egg-shaped delight works just as well outside of B&W's demo room. We'll let you know.